The reredos on the altar wall in the Chapel of Reconciliation was designed and created in 1984 by Robert J. Aldern, now Professor Emeritus, and Ann E. Kronlokken Widness, a 1983 graduate of Augustana College. A reredos is most often described as a free-standing wall or screen behind an altar in a church. In this case, it is attached to the wall. Many faculty, students and visitors have admired and found inspiration in the stained oak panels celebrating God's love through Christ. On April 2, 2008, Dr. Lindsay Twa, Assistant Professor of Art, delivered a homily in the Chapel of Reconciliation about the reredos and its impact: "Seeing and Believing: Bob Aldern's Reredos 'God's Love Through Christ.'" (Adobe Acrobat.pdf file, 107.02) She speaks about both Aldern and his work as an art historian. You will need Acrobat Reader to view the following .pdf files. You may download Acrobat Reader free of charge from Adobe's website. The theme of the stained oak panels is "God's Love Through Christ." Each panel represents an aspect of love as described below. 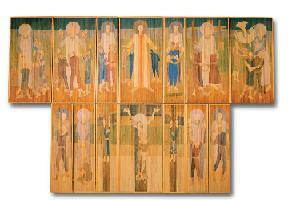 Talking about the panels, Professor Aldern said, "When you look at each panel, you see that it is Christ and the Land. We have here a long agrarian heritage; we are farmers at heart. If we consider the simple things of our faith when we kneel to pray, whether it be on a kneeler in church or a carpet in our bedroom, we are kneeling on the earth. We kneel on the earth to ask forgiveness and to accept grace." Aldern points to the enlarged hands of Christ throughout the composition. In the upper panel Christ's hands form an umbrella, an umbrella of caretaking. His hands are covering and protecting adults and children. It is important to Aldern that the chapel reredos are placed high on the chapel walls so that we look up, not to the work as a work of art, but as a symbolic act of submission to the sacred function we fulfill with our working hands under the protecting hands of Christ. The artist said, "The faces of the figures in the reredos are featureless because of a need for the viewers to identify with them, assume or transpose themselves 'into it.' The face of the Crucified Christ is the only specifically seen identity as the suffering sacrifice (human). The others are identifying with 'God's love' through Christ in different capacities in an aim to make the invisible visible...or...the spiritual in the painting and the spiritual in the content be one." Both the shape of the reredos and the chapel sanctuary floor reflect the shape of a Tau cross, a cross without the upper staff. Aldern recalls Palmer Eide's words that nature is never wrong in its colors. Even in its decaying fenceposts, fungi, animal remains, the colors are multiple and complementary. "We notice that there are no blue leaves on the trees." Aldern continues, "The leaves on the trees are not absorbed by the blue of the sky, but rather the leaves are complemented by the sky." He adds, with a twinkle, "Maybe there are blue leaves on trees somewhere, but I've never seen them." The artist grew up on a farm that the family ultimately lost during the Depression. Aldern notes that the older he gets, the sharper the recollections of his youth. He remembers the beveled glass in his living room window and looking outside through that glass and seeing patterns, the exaggerated colors of the earth, the reds, blues, greens. He remembers driving his tricycle through puddles of water, making shapes out of the mud with the tricycle wheels and noticing the texture of the patterns. Being called to supper by his mother, he forgot the mud puddles, only to notice later how the patterns had baked in the earth and how a fine layer of dust had drifted over them. Earthen tonations color Aldern's paintings. Aldern's recollections set the color tones of his works. For his early work he loved the ambers, the ochers, the earth greens, the grays, the blues — more solemn tones. Now he used more intense colors as well: corn yellow, the productive yellow of the wheat which can be brilliant, as well as the bright colors of the sky — sky pinks and reds. Aldern said, "There is an inner sound in the painting. I frequently say to students that their paintings are trying to get them to listen...hearing with the eyes...the painting is saying something...it has a role in its own destiny. We do not have the right to make all the decisions for it. The reredos is visual praise heard with the eyes as well as the sung and spoken praises to be heard with the ears in this place." Romans 12:1 — "I appeal to you therefore, brothers and sisters, by the mercies of God, to present your bodies as a living sacrifice, holy and acceptable to God, which is your spiritual worship." Matthew 3:8—"Bear fruit worthy of repentance." 1 John 4:20—"Those who say, 'I love God,' and hate their brothers or sisters, are liars; for those who do not love a brother or sister whom they have seen, cannot love God whom they have not seen." 1 Peter 4:8—"Above all, maintain constant love for one another, for love covers a multitude of sins." This panel is given in memory of Agnes Hegg Mast, 1917-1993, by Jorend Be Hegg Irvin. 1 John 4:19—"We love because he first loved us." Romans 8:25—"But if we hope for what we do not see, we wait for it with patience." Romans 5:5—"And hope does not disappoint us, because God's love has been poured into our hearts through the Holy Spirit that has been given to us." Job 29:15—"I was eyes to the blind, and feet to the lame." Psalm 41:1 —"Happy are those who consider the poor, and the Lord delivers them in the day of trouble." Psalm 36:9—"For with you is the fountain of life; in your light we see light." Proverbs 8:35—"For whoever finds me finds life and obtains favor from the Lord."